The perfect way to use up those late-summer gifts from the garden! Dovetailing Tips: Prepare the zucchini for meal 3 and 5. For Meal 3, use 4 zucchinis and make noodles out of them. Store in a sealed container to keep from crushing. Meal 5, Chop 2 medium zucchini into 1-inch pieces for Creamy Polenta. Brush a large, shallow baking dish with olive oil. In a large sauté pan, heat olive oil over medium-high heat. Add the onion and cook 15 to 18 minutes or until almost golden. Add the garlic and cook 1 to 2 more minutes or until thoroughly intoxicated from the divine aroma. Add half the thyme and salt and black pepper to taste. Drain off any excess oil. 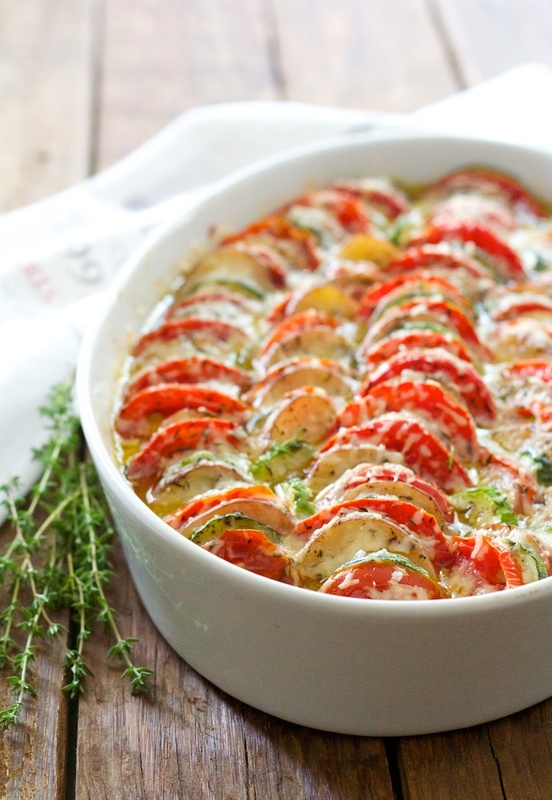 Transfer to the prepared baking dish and allow to cool while preparing the vegetables. Once they're arranged, sprinkle with more salt, black pepper and remaining thyme. Cover the dish with aluminum foil and bake 45 to 50 minutes or until potatoes are tender. Uncover, sprinkle with remaining cheese and and bake another 10 to 12 minutes or until cheese is lightly browned. Allow to rest 10 minutes before serving.